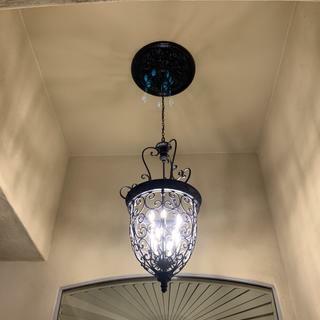 This rubbed bronze finish scrolling foyer chandelier is presented in rubbed bronze finish for a traditional look. With elegant scrolls and an open look, this large foyer chandelier lends beautiful style to entryways, foyer spaces, and large rooms. The design features an iron-look ornate frame with twelve lights clustered inside. Delicate metalwork connects decorative top scrolls with the main lower section. Add old world elegance and panache to your home with this grand chandelier. 27 1/2" wide x 54 1/2" high. Canopy is 5 1/4" wide. Weighs 51 lbs. 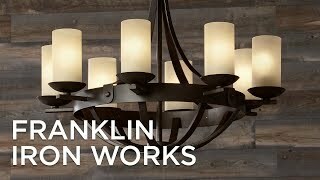 Iron-look, scrolling foyer chandelier from the Franklin Iron Works™ brand. 12 lights inside the open iron-look frame. 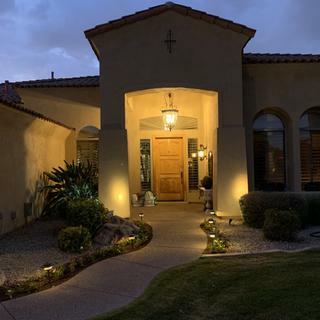 Rubbed bronze finish frame and canopy. Metal construction. It is perfect for what my foyer. Is there any way to get this fixture with a longer wire? I plan to install it in a large atrium, with 40 ft high ceilings. I am thinking 12 ft may not be enough. BEST ANSWER: Hi - I am sorry, we currently do not offer rewiring services for our lights. You will have to write the manufacture directly as the unit comes with a fixed wire and chain but won’t support a 40 ft high ceiling. A local lamp repair shop will be able to add the required length for minimal cost. can you get extra chain for it? BEST ANSWER: Hi, the French Scroll 12-Light Foyer Chandelier includes 6 feet of chain, 12 feet of wire; sloped ceiling adaptable. Additional chain is available to purchase in 3 feet increments. For assistance please call one of our sales associates at 800-782-1967. Yes, you can. LampsPlus stocks it. I believe the length is 3'. Does this come in a black finish? BEST ANSWER: This only comes in the iron-look, rubbed bronze finish. There are some additional options in a black finish - see the attached designs. Beautiful chandelier!! Looks grand in a foyer with 20+ ft ceiling! Beautiful addition to our entry way. The packing was amazing. No chance for it to be damaged. And quick delivery! This lamp is large. Two people are required to hang it. Bold and majesticthis chandelier pairs a French gold finished frame with elegant clear crystals. With an openiron-look scroll framethis design is ideal for foyer spacesgrand entryways and more.